In Newark our Parks for People program works to strengthen and empower communities through urban park revival. Parks are an essential element of healthy, sustainable communities and vibrant cities, offering opportunities for fitness and recreation, economic revitalization, and community empowerment. We're working to create a citywide network of parks and playgrounds so that all city residents have access to functional, well-maintained outdoor recreational space within a 10-minute walk of home. 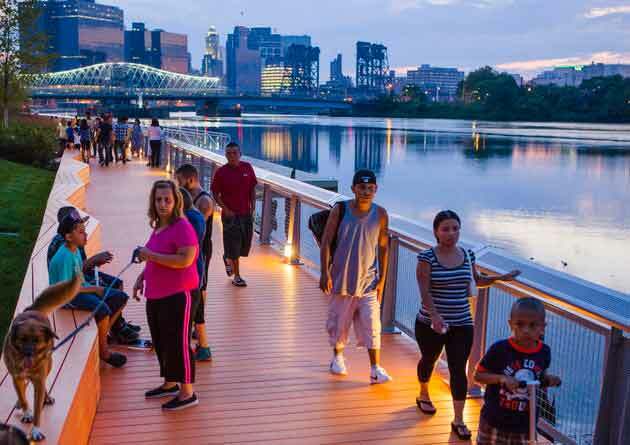 Our urban parks program reinforces the connection between Newark residents and their community through a variety of projects including Newark Riverfront Park, a landmark project reconnecting the city to its rich history along the Passaic River by providing community gathering spaces and a new public access point to the river. Community recreation spaces such as Jesse Allen Park, provide new playground amenities for all ages including skateboarding, basketball, Fitness Zone® exercise stations, and a water play spray area. And our green schoolyards, like Sussex Avenue and Lafayette Street, create dynamic and healthy learning environments for students while also incorporating climate-resilient features. The cornerstones of our park and playground efforts are community engagement, participatory design, partnerships with local organizations, and a strong focus on long-term stewardship. These elements are central to the ongoing success of these parks. To date, the Parks for People—Newark program has completed 13 parks and schoolyards in Newark’s highest-need neighborhoods.